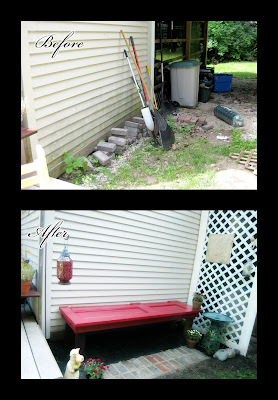 I have been wanting to redo this little corner for years. It is very dark and therefore won't grow grass and gets very mildewy (see first photo!) We have tons on crap sitting around our property that I knew I could put to use and repurpose to save resources and money. Overall, this project cost about $24. All I needed to buy was hex lag screws for the bench, a 4x4 for the bench and the mums. I made the top of the bench from an old door that has set by the fire pit waiting to be burned for years. I had the bricks (and I stole sand from the sandbox) to make the brick inlay. The lattice was also sitting around rotting behind our shed. I had all of the necessary stains and paints, so I just used the colors available. The accessories were stolen from other areas in the yard. Except... the cheesy sheep statue... that is what happens when you take a 3 year old to Lowes and let her pick out a piece of artwork for our new sitting area. But, she loves him, so that's all that matters. Now, you can't see our trash and recyclables from the deck and I like the look of the mulch much better than the gravel. Hopefully the grass seed I planted at the front with grow in, I added some very nutritious soil from my veggie garden, so we'll see. It actually turned out to be a pretty nice place to sit because it is shaded and stays nice and cool. All it took was a little imagination, a few hours, some sweat and my pink tool belt! I'm SOOOOOOO impressed! You are amazing!